I love when a company helps me think outside the box. Sometimes we get stuck in "beauty ruts" and gravitate toward the same type of colors all the time. 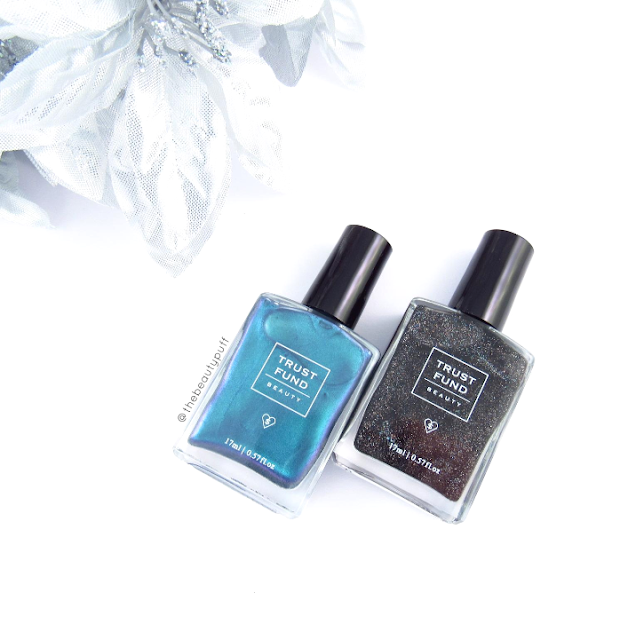 Trust Fund Beauty has expanded my beauty horizons with two gorgeous polishes from their Holiday Collection - Holiday Cliché and Black Heart. If you asked me to name colors I gravitate towards, the words "neutral" and "pink" would likely be top on my list. Black and blue aren't really my primary focus when I scope out new shades for my nails. But add a gorgeous, multifaceted glitter to a black and a mesmerizing duo-chrome to a fresh, vivid blue and you've got my attention. Trust Fund Beauty has a way of taking "ordinary" colors and turning them into something you just can't stop staring at. So take it from a neutral-loving girl - these colors are amazing. Black Heart is filled with so much glitter, I constantly turn it in the light as if I'm admiring a diamond. 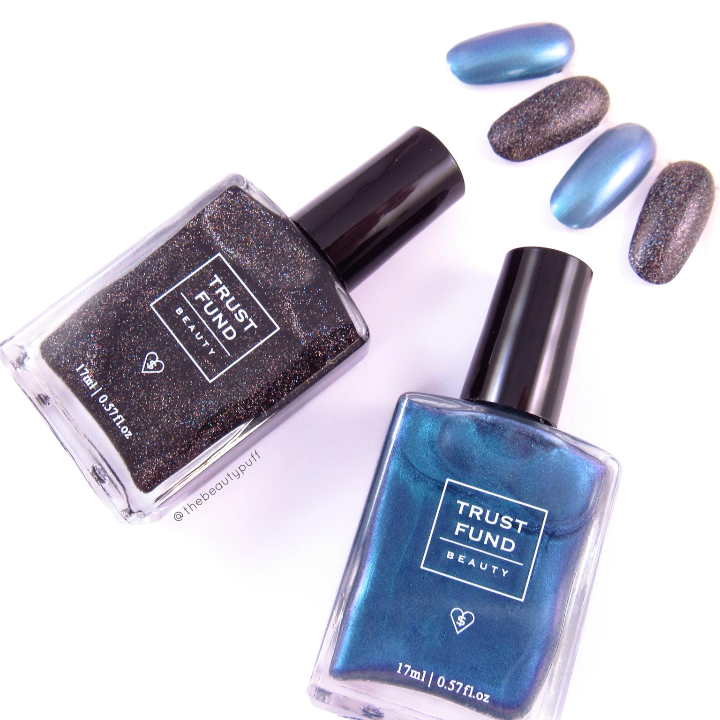 Trust Fund Beauty took an otherwise dreary color and literally, as they say in their description, put fun in it! You can sparkle any time of year with this shade. Afterall, glitter is never limited to any particular season right?? 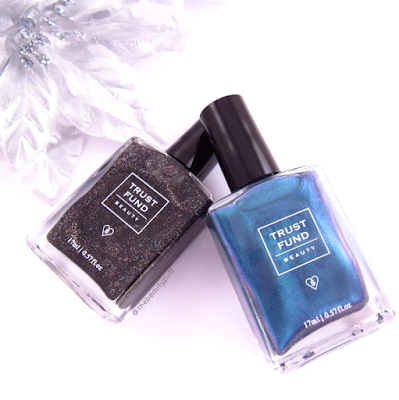 Holiday Cliché really caught me by surprise and turned out to me one of my favorite polishes by Trust Fund Beauty. I catch myself admiring it while I'm stopped at a traffic light, at home as I'm thinking about what to write about, really any time! It looks like a vibrant, aquatic blue in the bottle but as you turn it in different lights you see the beautiful purple variations. It's SUCH a stunning color. This would be gorgeous in the summer catching the sunlight too! In terms of application, three thin coats seemed to work best for me to get desired opacity. These polishes don't take long to dry which is fabulous! To get a shinier finish you can certainly use a top coat, but I personally love these polishes just as they are. If there's one thing I'm going to try for the New Year, it's to be a bit more adventurous with colors, finishes, you name it. You never know what you might find and if something might become a new favorite! So go explore what Trust Fund Beauty has to offer. You never know, you just might fall in love.